Thank you so much for contacting Quilts for Kids to help make quilts for seriously ill children. Unfortunately, it is our policy not to send kits to scouts, youth groups or schools because each kit costs us $55 to put together. There are many projects that would allow your group to sew and send comfort to other children. One idea might be for you to do drawstring bags. Look online at www.momtastic.com/diy/106558-diy-how-to-make-a-drawstring-backpack. It is very detailed with step by step photos. Part of their service project could be filling the bags with coloring books, crayons, small toys or toiletries for older children. If your group has already participated in these projects, you could make own quilt kits, as pictured above. Click here for a basic pattern. The quilts must be machine quilted to hold up to frequent laundering. You may have a guild or long arm quilter in your area that would be willing to work with you. 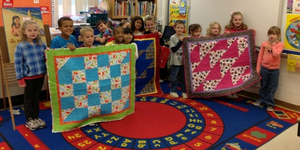 Look for a homeless shelter or head start program that will allow your group to deliver their quilts or other projects. It is very meaningful to the kids if they are able to complete a project and then put those quilts, bags or pillowcases right into the hands of those who need them. Quilts are also needed by your local firemen or police to carry in their cars for emergencies. Thanks again for contacting Quilts for Kids. Have fun giving back to your community!